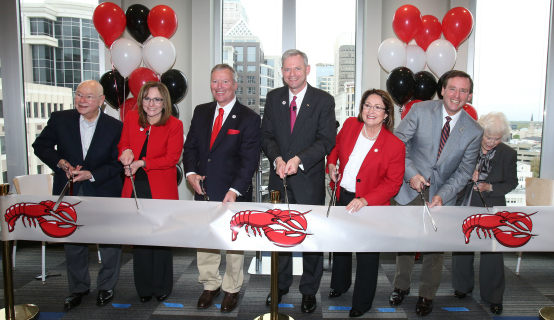 Red Lobster Seafood Co. officially celebrated its move to downtown Orlando, establishing its new restaurant support center and headquarters at CNL Tower 1, where its offices now occupy three and a half floors. Red Lobster support center employees gathered to celebrate as Orange County Mayor Teresa Jacobs and City of Orlando Mayor Buddy Dyer proclaimed March 6, 2015, “Red Lobster Day,” during a ribbon-cutting ceremony commemorating the next chapter in Red Lobster history. They were joined by Red Lobster’s executive leaders, city commissioners and other special guests to officially welcome Red Lobster to downtown Orlando. With this move, Red Lobster will now be one of downtown Orlando’s largest employers and the first in the restaurant and hospitality sector, with nearly 300 employees working in the new support center. The company plans to hire an additional 50 to 70 employees during the next two years, primarily in information technology, bringing more high-tech, high-wage jobs to the city. Additionally, more than 700 Red Lobster employees from around the country will visit the headquarters annually, to participate in the company’s industry-leading “Manager In Training” program, which provides employees with the skills and training they need to successfully manage a Red Lobster restaurant. In addition to the Red Lobster restaurant support center, Central Florida is home to 20 Red Lobster restaurants, seven of which are in Orange County. There are more than 1,800 Red Lobster employees throughout Central Florida. The company has 705 total restaurants throughout North America, a growing international footprint, and employs 58,000 people. Red Lobster’s move to downtown Orlando will culminate with the opening of its culinary development center this spring. Housed on the ground floor of CNL Tower 1, the center will have three main purposes – to create new, innovative menu items for Red Lobster’s restaurants, to train restaurant managers from around the country, and to host focus groups and other events in a tasting room modeled after a Red Lobster restaurant.